Item #17352: Sterling Silver man's ring with 9x11mm oval Almandite Garnet, round Diamonds of .05 Cts. TW and black Rhodium accents. Size 10. (WEB #SS-1903) Rhodium-plated Sterling Silver & 14Kt. Yellow Gold Lady's Ring with three 4x6mm oval Amethyst of 1.30 cts. TW; Size 7. (WEB #SS-1904) Rhodium-plated Sterling Silver & 14Kt. Yellow Gold Lady's Ring with 6x8mm oval Amethyst Cab of 1.49 cts. ; Size 6 1/2. (WEB #SS-1653) Rhodium-plated Sterling Silver Lady's Ring with bezel set 4x6mm rectangular Amethyst of .54 Cts. ; Size 7. (WEB #SS-1661) Rhodium-plated Sterling Silver Lady's Ring with channel set 5x7mm oval Amethyst of .74 Cts. ; Size 7. (WEB #SS-1675) Rhodium-plated Sterling Silver Lady's Ring with 6mm round Amethyst of .76 cts. ; Size 7. (WEB #SS-1700) Rhodium-plated Sterling Silver Lady's Ring with 14Kt. Yellow Gold and bezel set 6x8mm oval Amethyst Cab of 1.50 Cts. ; Size 6 1/2. (WEB #SS-1649) Sterling Silver Lady's Ring with bezel set 8x10mm cushion Amethyst of 2.56 Cts. and 14Kt. Yellow Gold Accents; Size 7. Item #16999: Rhodium-plated Sterling Silver ring with 6mm round Amethyst of .82 Cts. Size 7. Item #17122: Rhodium-plated Sterling Silver Lady's Ring with Black Onyx & round Diamond of .02 Cts. set in 14Kt. Yellow Gold; Available in sizes 7 & 8. Item #17113: Rhodium-plated Sterling Silver Lady's Ring with Black Onyx & round Diamond of .02 Cts. set in 14Kt. Yellow Gold; Available in sizes 7, 7 1/4 & 8. Item #17116: Rhodium-plated Sterling Silver Lady's Ring with Black Onyx & round Diamond of .02 cts. set in 14Kt. Yellow Gold; Available in sizes 7 & 8. Item #17119: Rhodium-plated Sterling Silver Lady's Ring with Black Onyx & round Diamond of .02 Cts. set in 14Kt. Yellow Gold; Available in sizes 7 & 8. Item #16981: Rhodium-plated Sterling Silver Lady's Ring with prong set 5x7mm oval Blue Sapphire of 1.19 Cts. ; Size 7. Item #SS-1690: Rhodium-plated Sterling Silver lady's ring with marquise Blue Sapphire of .17 Cts., pear shape Pink Sapphire of .22 Cts. and round Golden Sapphire of .10 Cts. Size 7. Item #QG-QR1774: Celtic Design Sterling Silver Lady's Ring of 4.25 Gms. Choose a ring size below. 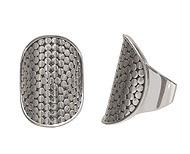 Item #17060: Rhodium-plated Sterling Silver & 18Kt. Yellow Gold Lady's Ring with Round Diamonds of 0.254 cts. TW. Item #CJ-R80231R-G: Sterling Silver Lady's Ring with five 3x4mm pear shape Garnets and one 2mm round Colorless Topaz. Choose your size. (WEB #SS-1756) Rhodium-plated Sterling Silver Lady's Ring with 6mm round Golden Citrine of .86 cts. ; Size 7. (WEB #SS-1757) Rhodium-plated Sterling Silver Lady's Ring with 6mm cushion Golden Citrine of .92 cts. ; Size 7 1/4. Item #SS-2279: Handcrafted Indiri Collection Sterling Silver adjustable Bola disc ring. Item #SS-1548: Handcrafted Indiri Collection Sterling Silver filigree Bali ring with 14mm checkerboard faceted antique cushion Amethyst. Size 8. Item #SS-1729: Handcrafted Indiri Collection Sterling Silver Bali ring with checkerboard faceted 9mm round Amethyst. Size 7, 8 & 9. Item #SS-1963: Handcrafted Indiri Collection Sterling Silver Bali Bola cigar band adjustable ring. Item #SS-1552: Handcrafted Indiri Collection Sterling Silver Bali Bola ring with nailhead design. Size 10. Item #SS-2054: Handcrafted Indiri Collection Sterling Silver Bali filigree ring with checkerboard faceted 9mm round Champagne Quartz. Item #SS-1963: Handcrafted Indiri Collection Sterling Silver Bali Hammered Texture Cigar Band Adjustable Lady's Ring. Item #SS-1725: 12mm wide Handcrafted Indiri Collection Sterling Silver Bali Tali air spinner band ring. Item #SS-2092: Handcrafted Indiri Collection Sterling Silver Bali tapered granulation ring. Size 8. Item #SS-2415: Indiri Collection Sterling Silver and 18Kt. Gold Vermeil adjustable beaded cigar band ring.